If you're looking for a Heathrow airport hotel at an amazing price, try one of our Heathrow Undercover Hotels. They're available at prices even lower than our normal rates. That's because we don't tell you which hotel you're staying at until you've booked. What is an Undercover Hotel? 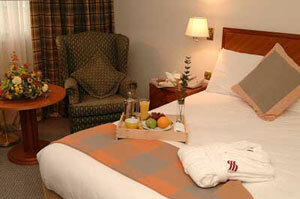 Our Undercover Hotels at Heathrow are all hotels that we already sell on our website. Plus, they're all rated 3 or 4-star, so you know you'll have a comfortable room with good facilities. You'll be able to see some details about the hotel before you book, including the star rating, and information about the parking and transfer arrangements. That way you'll have enough information to know whether the hotel is what you're looking for. Our star ratings are our own and take into account how far the hotel is from Heathrow and its transfer arrangements, as well as its facilities. Of course, once you've booked, we'll tell you the name of the hotel and give you all the information you need. Why book a Heathrow Undercover Hotel? Our Heathrow Undercover Hotels offer incredible value. You're getting the same hotel as someone who's booked it knowing its name, but you're paying less. Customers who've booked an Undercover Heathrow hotel with us regularly tell us how delighted they were with their bargain. Especially with the 4-star hotels, you can enjoy a level of luxury you'd never normally get for such a great price. Two of our Heathrow hotels - the Hilton Heathrow at Terminal 4 and the Sofitel Heathrow at Terminal 5 - are linked to the airport by covered walkways. All the rest are off-airport, which means they're outside the airport grounds, but within a few miles of the airport. Once you've chosen your Undercover Heathrow hotel, we'll offer you the option of adding some upgrades. Depending on which hotel you've booked, you'll be able to upgrade your room or book dinner or breakfast in the hotel restaurant. You can also book yourself into a Heathrow airport lounge, sort out your holiday insurance and currency, and get traffic updates by text on the day you travel.